I added this book to my list of reads after I realized that the author is the executive director of Food & Water Watch, an advocacy organization I follow quite closely. I was expecting it to contain about the same types of information that I usually find in books about the food movement. Interesting and informative, but not much new. Well, I was wrong. Foodopoly did have some familiar themes, but the level of research and explanation in this book blew me away. Hauter’s main argument is that while focusing on changing consumer behavior and “voting with your fork” is important and has its benefits, no large scale change will happen without complete reform of the faulty industrial, corporate-controlled agriculture system that we have now. What this book does really well is explain how we got to where we are, and what the factors are that contribute to it staying this way (and getting worse). I expected a book with such an extensive and thorough notes section to be dry, and while it did take me longer to read than some other food books, it’s because there was so much information to absorb. Reading Foodopoly really hammered home for me how much of a privilege it is to be able to buy food from local farmers, living in an urban area where many farmers are able to make a living by providing food direct to consumer. I was reminded that many small and mid-size farms across the country do not have direct-to-consumer sales as an option, and are forced to grow commodity crops where they are paid less than the cost to produce and to work within monopolistic corporate systems. 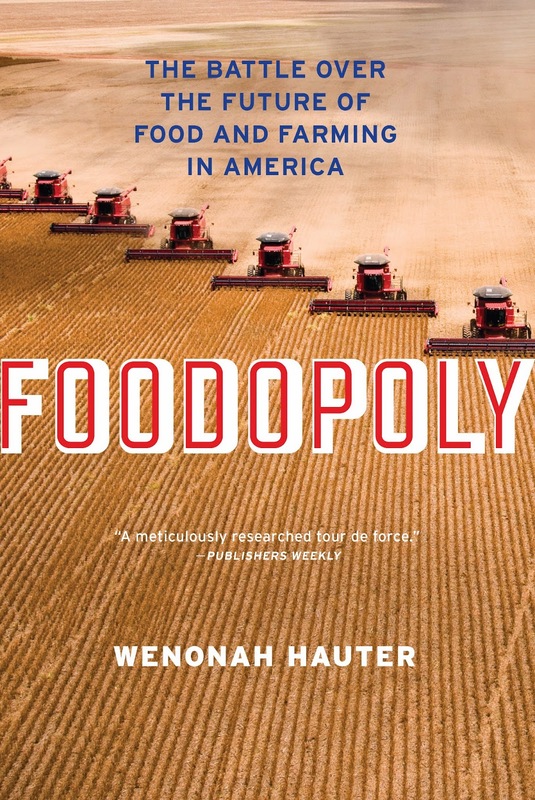 This book covers antitrust laws through this country’s history and the impact that deregulation has had on food and farming in America. Though I knew that many organic producers have been taken over by giant food conglomerates and that only a handful of corporations control all sectors of our food chain, reading Hauter’s logical explanations of what happens behind the scenes makes you realize that this country has allowed business to be the watchdogs of our public health and welfare. Foodopoly also covers genetic tinkering – not just genetic engineering of plants and animals, but synthetic biology and the groups that are trying to use government money to actually create life for profit. Here as in other places in the book, compelling evidence and meticulous research support her arguments. The only thing I felt this book lacked was a “now what” at the end. I was waiting for a chapter on practical ways to support the kind of large scale political movement she describes, especially after the book fired me up so passionately about moving beyond just supporting our CSAs and avoiding processed foods, etc. I do have a goal to write to my legislators more often this year, and I’ll continue to try to read up on legislative and judicial instances where public comment is needed. If you’re looking for research and facts to back up the feeling that our system needs to be fixed and not just consumer behavior, Foodopoly is a fantastic place to start. GMO culture war – is there a middle ground? Recently, a reporter from Grist, one of the country’s premiere environmental magazines, finished a sixth month series on GMOs. He used the series to investigate the truth about GMOs outside of the two opposing narratives that are usually circulated. On one hand you have the pro-GMO people, who see GMOs are a feat of human ingenuity and technology/science that will save agriculture as we know it and go a long way to address starvation and hunger across the globe. On the other hand, the anti-GMO people, who see GMOs as a symptom of corporate control of our food system and the unsustainability of modern agriculture, not to mention a health risk. I haven’t read all of the pieces in the series (though I probably will start to go through them). And Civil Eats also addressed his piece on their site, with a compelling rebuttal. In particular, that essay addresses what agricultural priorities should be if we are trying to envision a sustainable future. And points out rightfully that the companies involved in GMO technology are also the ones that poisoned us with Agent Orange, etc. The writer acknowledges that the debate does obscure the technological innovations that do need to occur in order to move toward sustainability. For me, the GMO issue primarily comes down to the issue of transparency. If I believed that as a nation we could keep corporations accountable to make decisions in the public interest, it would be one thing. But we can’t, and we know that much of the scientific research being done about GMOs (all types) is controlled by parties with a financial interest. We need third party research that’s independent. That encourages human innovation and scientific development, but with an eye toward sustainability. That researches the health and environmental effects of these plants. And we need a system that errs on the side of caution, not risk, when it comes to public health. While I don’t agree with him entirely – I think we need to avoid adopting a flippant attitude about GMOs – Nathanael Johnson’s Grist piece is food for thought and encourages us to dig through the hype for what’s actually true when we talk about GMOs. The food world was buzzing last week with the announcement from General Mills that Original Cheerios are going GMO free. This is the only variety going GMO free, since original Cheerios are primarily made of oats, which are not genetically modified. The sugar and corn starches will be going GMO free. The way that the media exploded with the announcement shows me that people are starting to demand GMO free foods, or at the very least, more transparency about what’s IN their foods. This is positive progress. But I can’t help but feel that the hype can also distract from the most important parts of a healthy lifestyle. GMOs in food or parabens and other chemicals in soaps or household cleaners are important to understand and good to avoid when possible. But limiting your exposure to these is a secondary priority. It doesn’t matter if you eat GMOs in your breakfast cereal, if you’re also addicted to soda and fast food and processed junk. As you’re thinking about setting priorities for your new year, focus on specific tasks that can help you hit those main priorities. Maybe it’s avoiding fast food, cooking more often at home, drinking more water, or getting exercise 2 or 3 days a week. Choose small things to tackle, so they aren’t so overwhelming. Take one step toward one goal, not 12 steps toward 10 goals. For example, if you want to cook at home more often, check out this post on where I get a lot of my clean recipes. When you see or hear the word “natural,” what comes to mind? Something connected to the earth, unadulterated and in its ‘default’ state of being? Images of nature? Thoughts about health and wellness? Do you get an innate sense that “natural” is a good thing, in opposition to “unnatural”? You do? Congratulations, you’re a marketer’s dream come true. The federal government, through the USDA, certifies the term “organic” and regulates its usage. To label something “organic,” complex standards have to be met. Primarily this includes the method of production (no GMOs, ionizing radiation or sewage sludge), the items used in production (only those on the nationally approved list, e.g. no chemical pesticides) and inspection by a USDA certifying agent. You can read more about it here. There currently exists no standardized, legally enforceable definition of “natural.” Several agencies have tried over the years to define it, but industry push-back has succeeded in squashing those attempts. Why? Because if consumers equate “natural” with “organic” anyway, why would Big Food go to the expense of certification and paperwork and better sourcing of ingredients? They can make a better profit margin by calling something “natural” and getting the consumer to buy it because they think it’s a superior product, when in fact, it’s not at all. Recently lawsuits have been brought against the companies that produce Naked Juice, 7Up, Vitamin Water charging them with misleading or false advertising for claiming their products are “all-natural” when they included additives. Naked Juice just agreed to settle their large class action this month. On the surface, this is great for consumers because it’s bringing awareness to the use of the term “natural” on products. But it doesn’t stop other companies from using it or work toward a legally enforceable definition. A suit ending in settlement doesn’t create any legal precedent. This article from Salon further explains these lawsuits. 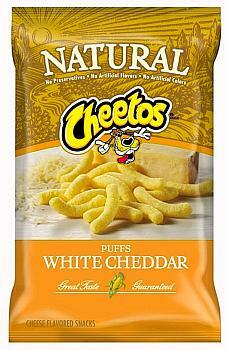 Yes, those are Natural Cheetos. Just think about that for a second. Natural. Cheetos. You don’t have to turn away all products that claim to be “natural,” though. Instead of signaling you to walk away, read the label. Do the ingredients listed seem appropriate and recognizable to you? Do you see corn or soy as one of the ingredients? If so, it’s probably GMO, unless the label says it is certified non-GMO. Common sense is your ally – call it the natural Cheetos test. Another movement is happening to bring meaning to the term “natural” outside of government regulating – called Certified Naturally Grown (CNG). Primarily for the produce and livestock industries, it’s a grassroots effort designed to help small farms and producers who sell their products locally get credit for the ways they produce without having to go to the expense of the national organic program. CNG farms are inspected by other farmers and all records are available for public viewing. By reading the labels of the foods you buy and consume, you’re taking the control back from those companies and not buying blindly. Don’t be a sucker for “health washing” – the trend of making items appear to be more healthy than they are. Remember that the healthiest foods – the clean, whole foods – don’t need marketing to convince you they are healthy. Or a creepy cartoon cheetah. I’ve written about GMOs before and explained why I subscribe to the “harmful until proven safe” mentality as opposed to “safe until proven harmful” when it comes to my foods. This is one reason why I support mandatory labeling of GMO products. An interesting study was released recently which sheds more light on problematic GMOs. Headlines appeared everywhere, calling the new study “alarming” and “groundbreaking.” The basic conclusion of the study? Pigs fed a diet of GMO grains were more likely to suffer from stomach inflammation and had heavier uteri, which is a sign of conditions that could affect their fertility. Anti-GMO groups hailed this as one of the studies they’d been waiting for that showed an adverse health effect on animals that we consume and not just animals in laboratories like rats. Industry leaders were quick to denounce the study and its research methodology. So who’s right? Well, both. First of all, the scientific journal that reported the study is called the Journal of Organic Systems. One of their sponsors is the Organic Federation of Australia. Organic producers are often looked at as the “good guys” in agriculture, and I definitely am grateful for their contributions, as our family eats as organic as possible. However, organic producers are often corporations whose primary motivation is profit, not the health of consumers. So it’s in the best interest of organic food producers to have studies that show that GMOs are harmful. Since no GMO ingredients are allowed to be in any product labeled certified organic, they have a vested monetary interest in supporting labeling efforts and fighting GMOs. Because of this, research they sponsor is as tainted by suspicions of bias as the research that Monsanto backs saying GMOs are truly safe. The editorial boards of scientific journals are often made up of individuals who have a corporate interest on one side or the other. The fact remains that there are very few studies (and virtually no long-term studies) on the health effects of GMOs at all, let alone truly independent, third-party studies. Why? Because the producers of these GMO seeds (ahem, Monsanto) have such strict patents on the technology that they are unobtainable for outside research. Growers are made to sign contracts stating that they won’t perform any research on seeds. So when someone wants to do a study, they have to buy retail products made from GMO plants and can’t directly grow their own. Because companies like Monsanto have those intellectual property rights and are only required to do voluntary safety consultations on their products, there is currently no real or independent safety testing on GMOs. And there’s where the problem is. We need independent safety testing and we need long-term studies to begin. Because right now, when you eat a product that contains GMO ingredients, the safety testing is being performed on you as a consumer without your informed consent. And this is why labeling is so vitally important. Let Monsanto grow all the GMO products it wants. Let the consumers be informed and make decisions about what they eat. Tell consumers the truth. Right now, we don’t know if GMOs are truly dangerous or unsafe. And until Monsanto stops hiding behind intellectual property laws and opens up their seeds for independent testing, we won’t know. I’ve even thought that a label similar to the one that appears on dairy products would be appropriate. If a company wants to label their milk rBGH-free, they also run a disclaimer saying that the government has found no difference between milk from cows treated with rBGH and those that weren’t. I appreciate the information, and choose as a consumer to not consume dairy with rBGH in it anyway. Because it’s my right. GMO labeling initiatives are starting to make headway in America as many states have bills up for consideration in their legislatures. Here in Pennsylvania, a bill was introduced in the Pa. Senate in March called “An Act Requiring the Labeling of Genetically Engineered Food” (SB653). It is now in the Agricultural & Rural Affairs Committee. Surprisingly enough, PA is third in the nation for organic agriculture production, so I’m hoping that enough of a push exists to protect that industry that this bill will make it for full consideration. I plan on contacting my senators again on this one. GMO wheat is not authorized for commercial planting, but an Oregon farmer found it on his land. Wheat is a huge export crop for U.S. farmers, which is why GMO wheat is not authorized to be planted. Other countries, particularly in Europe and Asia, won’t buy GMO products. More tests are being done to determine how the wheat got there and the extent of its presence, but it goes to show how easily these GMOs can sneak into our food supply. This article showed up a lot on the Internet a week or two ago and was laughable. The National Confectioners Association funded a study that concluded that candy was not associated with any health risks. Wow! What strikes me, though, is that people are quick to laugh when a candy company funds research that promotes candy as part of a healthy diet, but we listen to soft drink manufacturers and other Big Food/Big Ag companies tell us the same things, with research funded by their own interest groups. When you see a new research study released that touts the health benefits of a food, look closely to see who sponsored the research An independent or government group? Or industry? This statistic is shocking, but not surprising: “The USDA’s Food Safety Inspection Service issued 44,128 noncompliance records (NRs), but only 28 of the nation’s 616 swine plants ever faced suspension.” Even those don’t stay suspended for long, and many are repeat offenders. Read the list of offenses and I doubt you’ll be drooling for conventionally raised pork anytime soon. This is why we NEED to fight Ag-Gag laws – our government “inspections” are meaningless. I am proud that I’ve never asked these questions at a farmers market, though this article sheds some light on what it’s really like for farmers to participate in these markets. Scotts Miracle-Gro knowingly sold bird seed with unregulated and illegal pesticides for two years. These pesticides are poisonous to birds, but were added to control insects eating the seed in warehouses. Reason #562894 that I won’t buy anything from Scotts – not even their organic products. I’ve written on GMO labeling before, and this is an issue that is constantly evolving and changing. It’s about time. I am working on drafting a letter to send to my legislators here in Pennsylvania, and when it’s ready, I will share so you can pass the word! Speaking of legislative advocacy, Ellen DeGeneres had a representative from the Humane Society on her show to talk about Ag-Gag laws. Ellen’s got a wide audience and huge following, not only for her general awesomeness but her advocacy work on the part of animals. I’m really happy to see someone like Ellen educating and encouraging people to take action. Yet more proof that eating antibiotics in meat is detrimental to our health: government researchers have found bacterial varieties in meat that are resistant to antibiotics. Environmental Working Group has some great information on superbugs in meat. You may have heard some news recently about a so-called “Monstanto Protection Act” that was an Agricultural Appropriations Bill (HR 933) that contained a provision (in section 735) allowing companies to harvest GMO seeds, even if an injunction or other litigation is pending against them. Watch as John Stewart brilliantly sums it up for us. You stuck what where now? All of the issues with GMO labeling and Big Ag aside, it makes me so utterly disappointed in our government that anonymous, secret riders can be snuck into any bill, particularly one that would avert a government shutdown, which are almost inevitably going to be signed into law. It represents the highest level of corruption, greed and fraud that politicians can be bought. It wasn’t even just votes that were bought on an issue that was out in the open, but Monsanto effectively purchased a law that benefits their business to the detriment of the environment and our health, behind everyone’s back. Even when Senator Tester stood up, not enough people listened. Our government is for sale to the highest bidder. When you are making your choices about what kind of fertilizer to buy for your garden this summer, look into who makes those products. Are you buying Monsanto products (RoundUp, Scots, etc.)? If so, you’re helping to subsidize the purchase of our government. You might not think $20 here and there matters, but until Americans start standing up one by one and saying “here is the line and I will not cross it,” we can expect these companies to continue to buy their way into our government. This probably sounds melodramatic. But I truly believe this is how democracy vanishes. Crossing the lines we said we’d never cross.